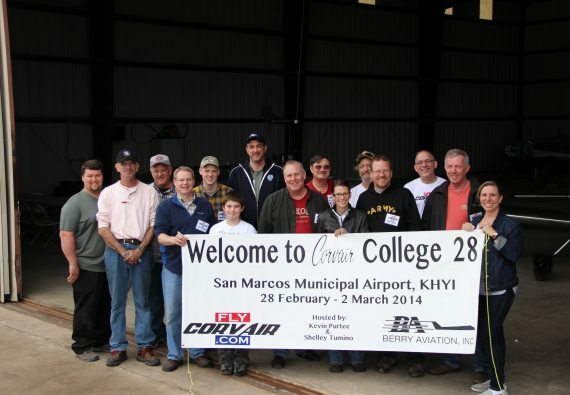 Here is a review in photos of Corvair college #28 in Texas, with local Hosts Kevin Purtee and Shelley Tumino. The pictures are mostly people, because a lot of the focus of colleges are people. As you look, picture yourself, among new friends, making progress, learning. We are a few weeks away from College #29. Don’t miss the sign up, College #30 is six long months after #29. Don’t give up most of another flying season to delay. 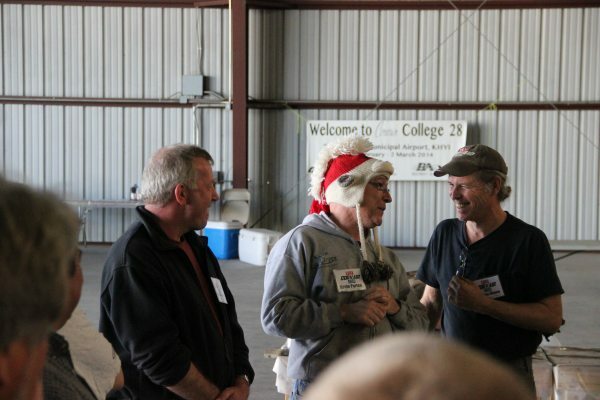 Success in aviation comes from having a plan, the support of a small group of experienced builders, and learning. You can find all three at a College. 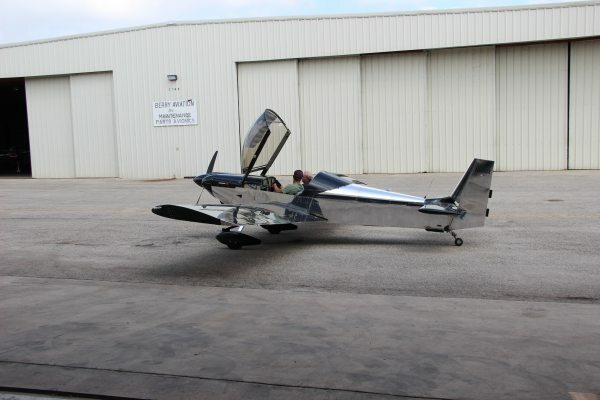 Byron Engle, old school EAA builder, working on a 2700 for his Turner t-40. He has been in the EAA since the 1960’s. 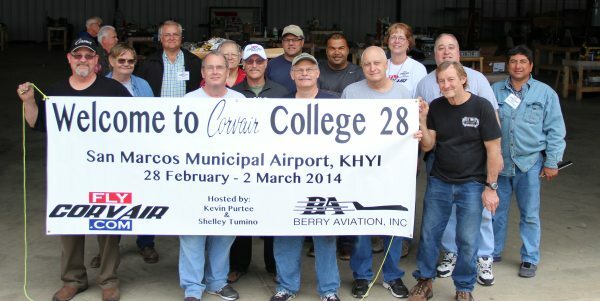 Byron was also at CC#22 in Texas 2 years ago. Kevin wears the “Hat of Power” while builders gets started on core engines. Team work of new friends took cores apart very rapidly. 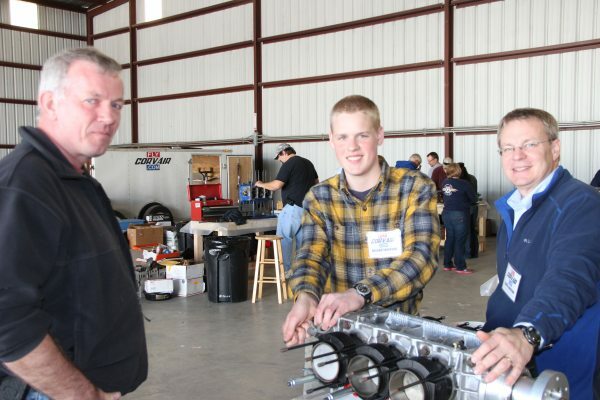 A mentor in the making: Award winning Corvair Pietenpol builder pilot Hans Vandervoort, speaking with father / son Kelly and Joseph Jameson, who have a Piet in process. Dad is very clear that his 16-year-old son is heading up the project, he is just supporting it. Joseph has a set of skills and maturity that are truly uncommon in teenagers. Engine is a 2,700 Roy bearing power plant. 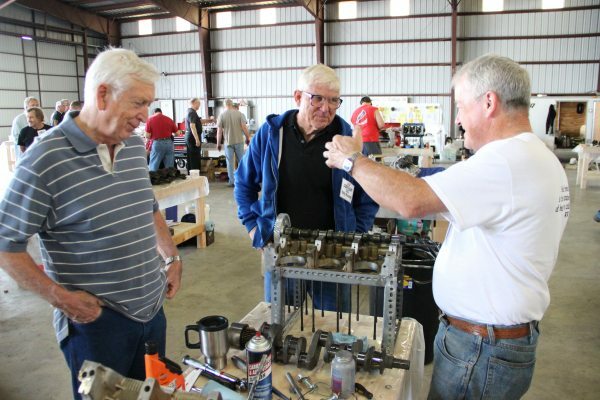 Demonstrating an upgrade to exhaust valve rotators on Ken Bickers Piet engine. 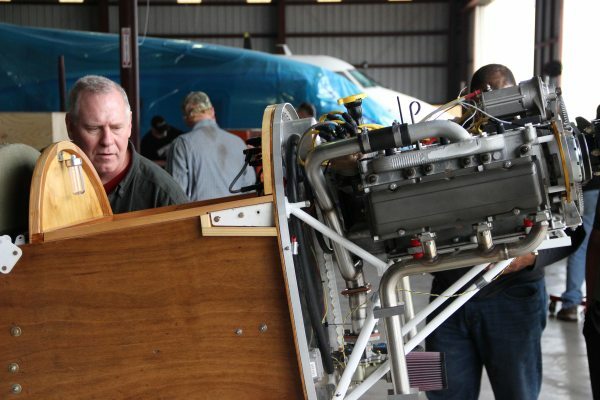 Ken has been working on his plane for 19 years but is closing in on finishing. 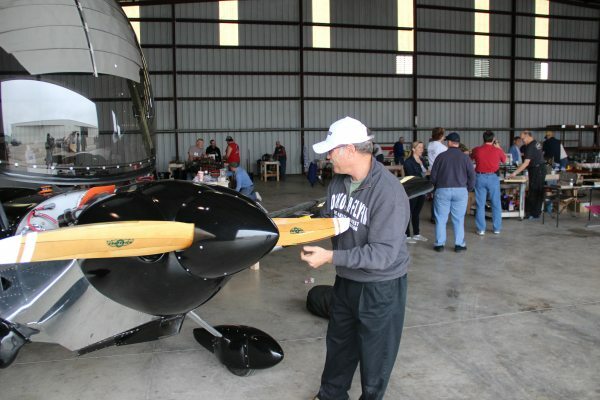 Persistence pays, Kevin Purtee worked on his Piet for 16 years before it flew. 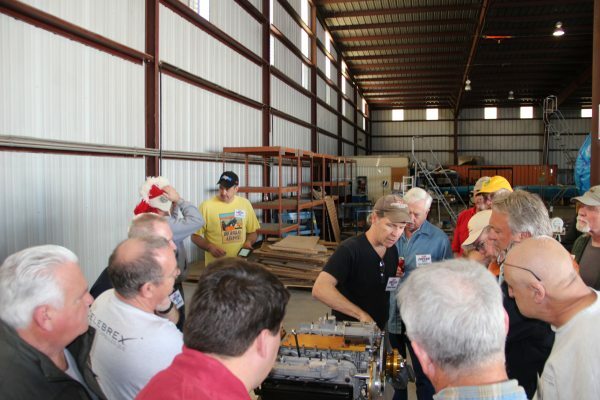 Hands on practical demonstrations, done on builders engines, are what colleges are all about. In orange is Tim Hansen, who as a college student to a Greyhound bus 27 hours each way to Corvair College#9. Today he is a pilot and building a first class Corvair for his project. Success in airplanes is made out of determination to win, not money. 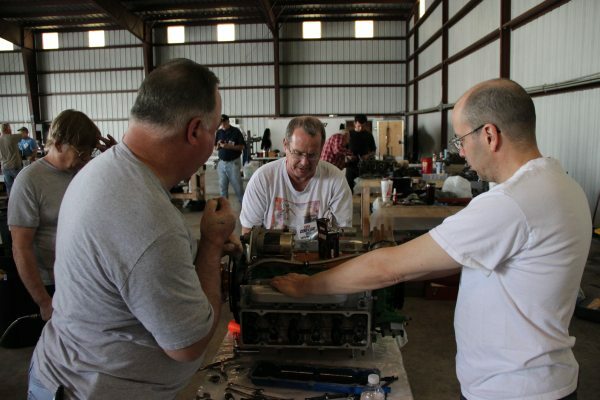 1/2 of “Team Stinemetze,” brothers Tom and Karl, with an engine destined for their Pietenpol. Core from a manual trans mission Corvair. Pose with attitude comes from builder satisfaction at knowing Corvairs and Colleges are a good choice. Piet Builders Dean and Robynn Trzynka, working on their core. They drove 20 hours from Wisconsin to get to the college. They now have several personal friends in the Piet and Corvair community. This is how you build a group of supporting friends for your project. 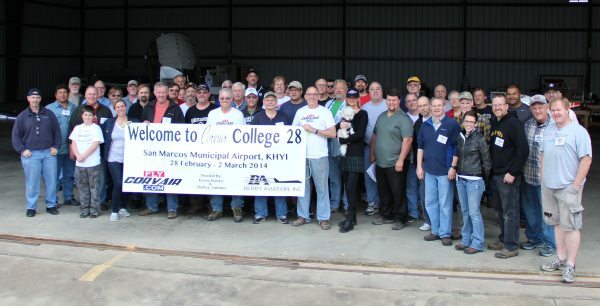 CC#28 is ScoobE’s latest college. His first was CC#16 in SC. In between he missed only #18 and #20. He wanted to go so bad that he sat in the Suburban by himself for many hours before our departure from Florida. Show him a suitcase, and he is headed for the truck. 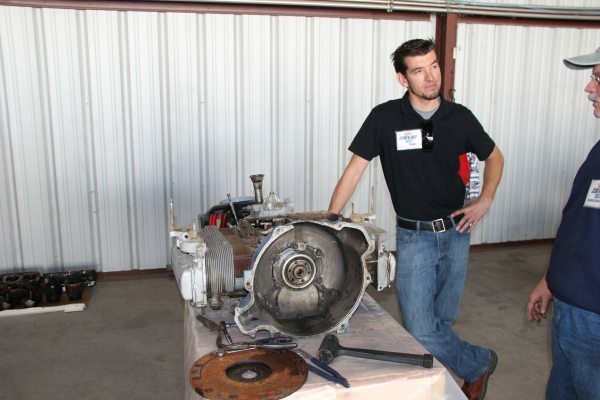 Mark from Falcon shipped in heads direct for Gary Bassham’s 3,000 cc Zenith engine. They came in this box. 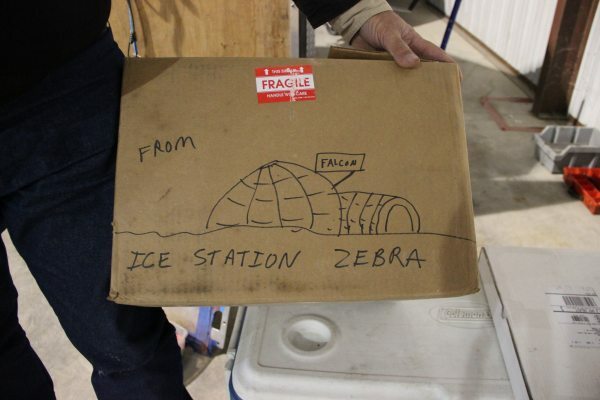 “Ice station Zebra” is how Mark answers the phone in his shop in winter. It is a metal building in Fitchburg Wisconsin. I called Mark last month and found out there was a 85 degree temperature differential between our shop in FL and his. Introduction speech on Friday. Our drive to Texas was slow going, taking 28 hours on the road with breaks. We arrived a little tired, but enthusiasm kicks in right away and we worked until 11pm on Friday. Saturday was the big productive day running from 8am until 11 pm. Sunday started with 75 degree sunny weather, which deteriorated to 50mph winds, torrential rain, and then snow by noon. Puddles in the parking lot turned to ice. People from outside Texas got very concerned, Texans just slowed down long enough to put on sweatshirts. I spent the morning trying to work through a bad migraine that was harsh enough to have me intermittently out of action. My sincere thanks to the builders who recognized this and kicked into high gear support mode to assist Grace in getting things done. 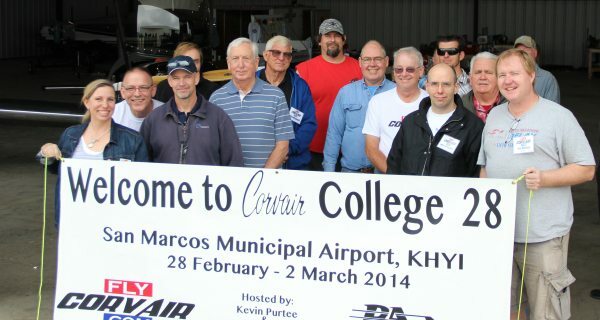 Left, Hans Vandervort, middle Kevin Purtee and myself, all three Corvair /Piet guys with a total of about 1,000 hours on the combination between our planes. Photo was Friday afternoon. Although we have worked with him for many years, this was the first time Grace and I had a chance to meet Hans, a native of The Netherlands (Holland), in person. He has been flying his Piet a number of years, and is now building a Bearhawk. Zenith 601XL-TD Builder Andy Elliott flew in from Mesa AZ in his 3,000 cc Corvair powered bird. It has about 600 hours on it. The trip was about 750 miles. Read his story at this link: Zenith 601XL-3100cc Dr. Andy Elliott. Engine is now a 3,000 with a Dan Bearing. Zenith 650 builder Larry Magruder and I putting a dent in the coffee pot. 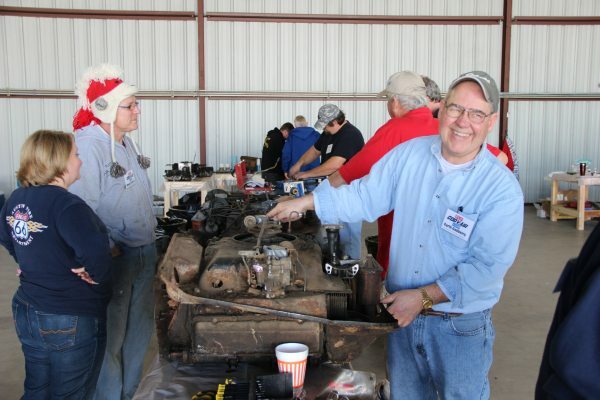 Larry’s engine ran at CC#25, but he brought it to #28 so I could install exhaust valve rotators. We did this with air pressure in the cylinder, so the heads did not have to come off. Neat trick with basic tools. 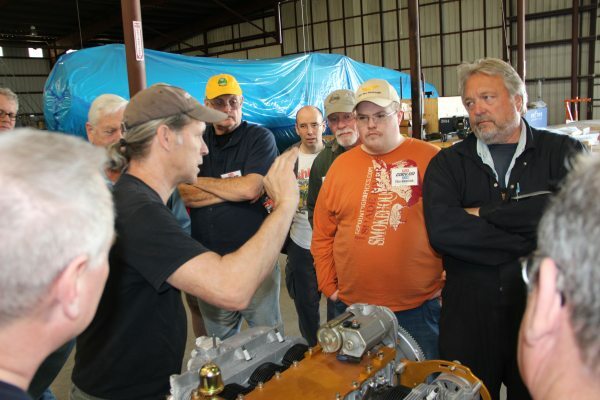 Read about Larry’s engine running at: Corvair College #25, In Photos. Saturday’s group photo, 55 Builders were on hand. The was the first college for 70% of the builders. We got the Pietenpol builders to pose as a sub group. The Chouinards are Tallest and shortest builders in the photo. Nice to have two marred couples and two father/son teams in the picture. The “other”Builders, representing Dragonflys, KRs , Neuports, Turner, Little wing Gyro and more. Corvair works on many airframes. Yes, you can be in two sub photos, if you have both a Piet and a KR project. The Zenith Builder sub group. About an equal split between 601/650 builders and 750 builders. 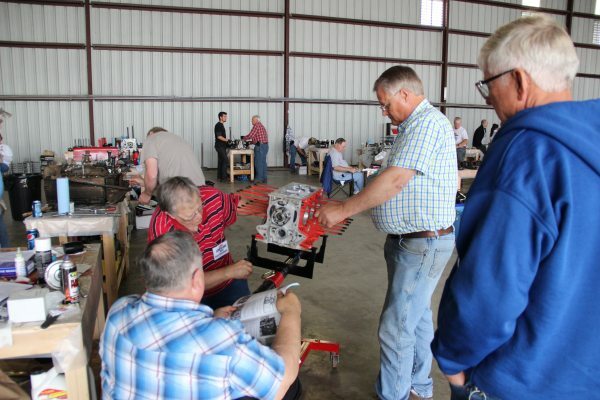 Many of these guys are planning on attending CC#30, which will be held in September in Mexico MO, at the Zenith factory, just before their open house. Kevin and Shelley arranged to have generous amounts of hot chow available for builders at most time during the long days. Builders, took breaks and gathered in small groups to fuel up and compare notes. The only “formal” dinner was Saturday night. Friday we all ate the College traditional pizza dinner. 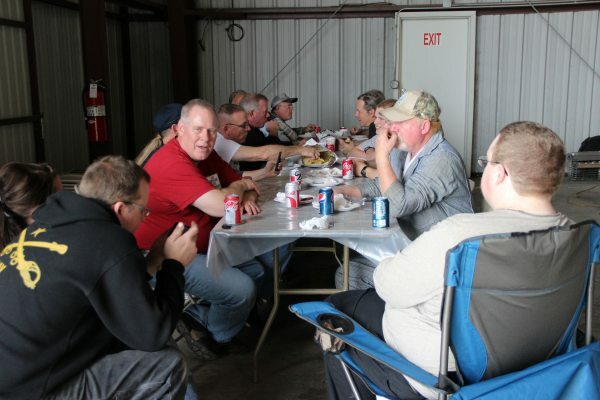 Having the food on hand is a key element of productivity, that no one need to leave the hangar, even in a very long day. Andy Elliott took a number of builders for their first flight in a Corvair powered plane, as weather permitted. This is fun, but it is also valid training. Understanding what a properly running engine sounds and feels like in the cockpit is important. Years ago I had a builder who had never seen another Corvair turn a prop call me before his first flight and say “My engines running good, It is almost as smooth as my C-150’s O-200.” I told him to stop immediately. Another inspection revealed he had reversed two plug wires. Anyone who has seen a correctly set Corvair run understands the engine is far smoother than any four-cylinder Continental. 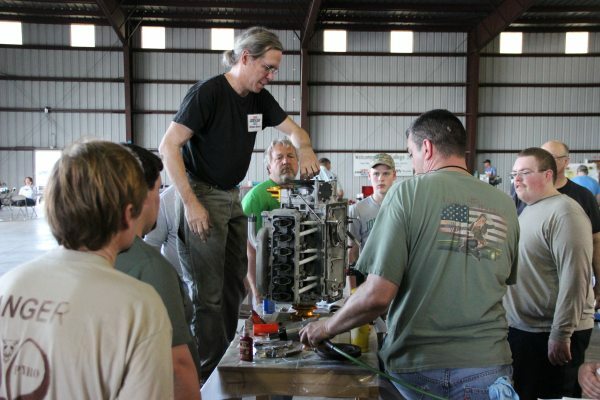 Gary Bassham leads a team of builders that includes his brother, assembling his 3,000 cc engine. It is destined for his Zenith 601XL. Kevin had pre-constructed several dozen 2′ x 4′ work tables. It proved to be very efficient, each engine having its own table. In a pre-college message Kevin called the 2″x4″ tables which lead to some jokes about the 18″ tall Stonehenge in the spoof film Spinal Tap. 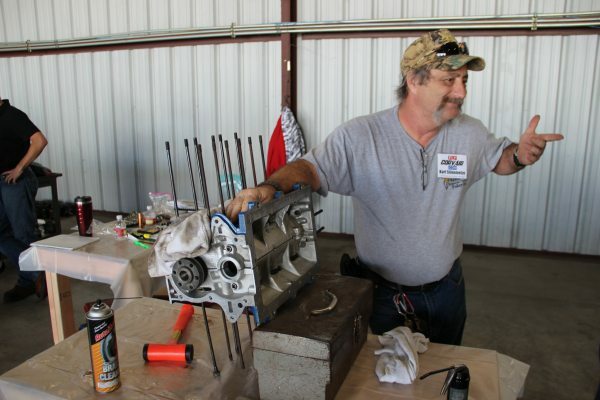 Byron Engle has the moment of victory on installing his Gen #1 Dan bearing, where his total run out was down to .0004″. 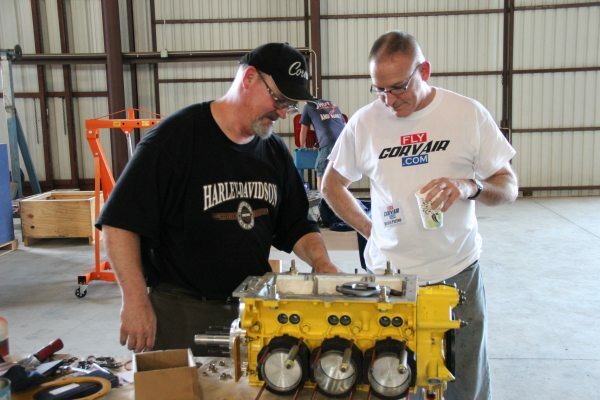 Above, I check the timing marks on Gary Bassham’s 3,000 equipped with a Gen #2 Dan bearing. 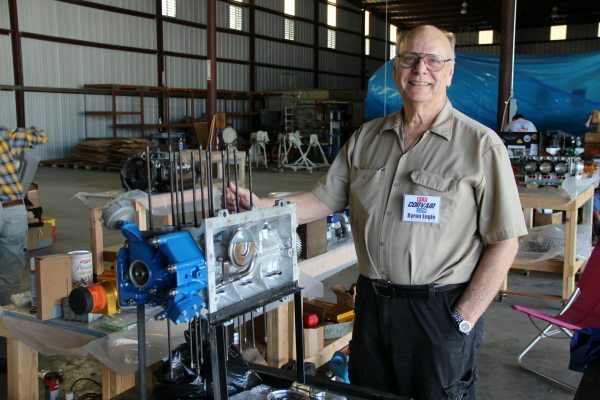 Piet builder Ken Bickers cam in from Colorado with his 2700 cc Roy bearing engine. We popped the heads back off to install rotators and change the sub standard exhaust valves that were installed by a local machine shop. It was a quick lesson to everyone present that it is never worth putting off things your motor will benefit from. The entire job took a few hours of casual work. Ken’s airframe is done and painted. Zenith 650 builder Larry Magruder changing to rotators on his exhaust valves. This was done with the heads on the engine. Larrys heads were done a number of years ago. Today all heads done by Falcon have rotators installed. 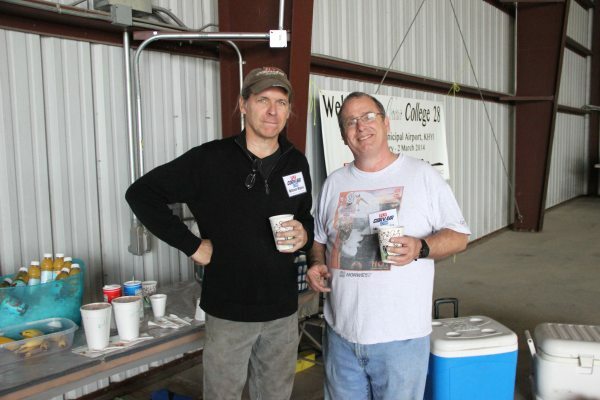 Builders enjoy smiles and stories on Saturday. Tee shirts are a good indication of the weather we enjoyed other than Sunday afternoon. I stand on a stool to assist Piet builder Mark Chouinard to install his balancer. 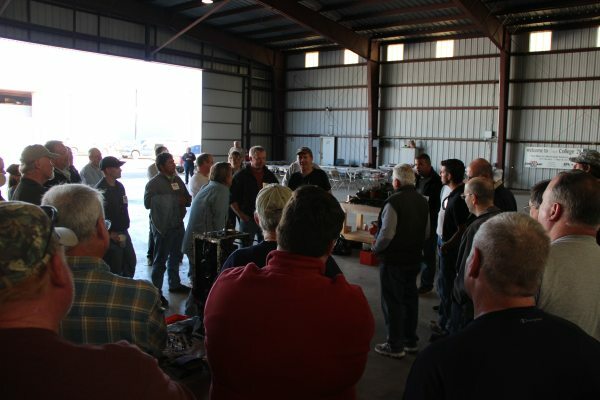 This was the in-person training to go with the written story: Balancer Installation. The engine is a 2,700 Roy bearing power plant, with Falcon heads. 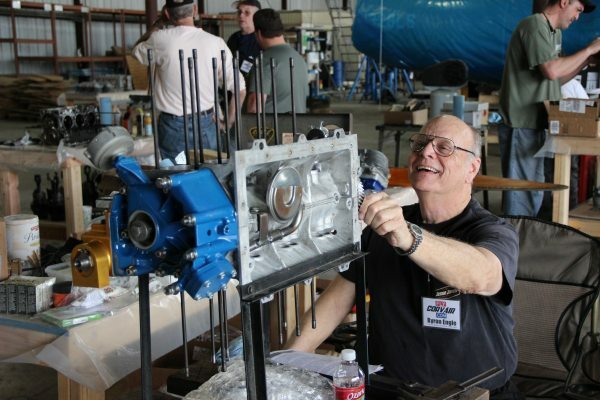 Zenith 650 builder Brian Manlove works on his 2700 cc Roy bearing engine while Kevin Purtee watches. 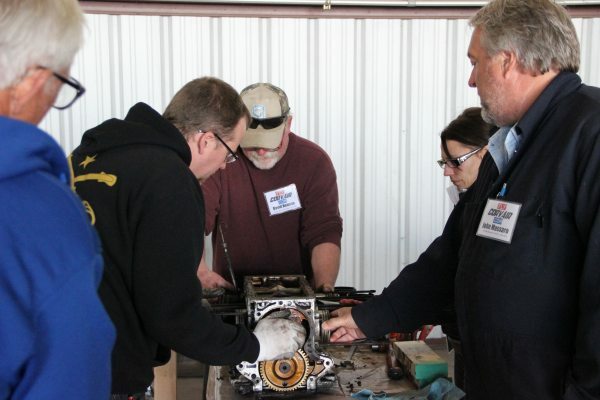 By the end of the event, Brian had the engine completely assembled. Grace and Old friend/KR expert/Mr. NVaero.com Steve Glover. He is kind of a prankster; Two weeks before the college I walked into my shop with a neighbor, and caught the end of a phone message where an ominous voice repeated “You can expect trouble in Texas.” My neighbor was worried until I explained that this was just my friend Steve saying he was planning on attending the College. Steve’s sense of humor and definition of entertainment was developed during long service in the Marines. Many builders talk about all the things they get out of Colleges, but lets reverse this for a minute. The above photo is a snapshot of what Grace and I get from colleges: a level of friendship and mutual respect we have with our builders. I have been working in experimental aviation a long time, I know many other people who also do, and I will flat-out tell you that other businessmen do not enjoy the friendship of builders at the same level. 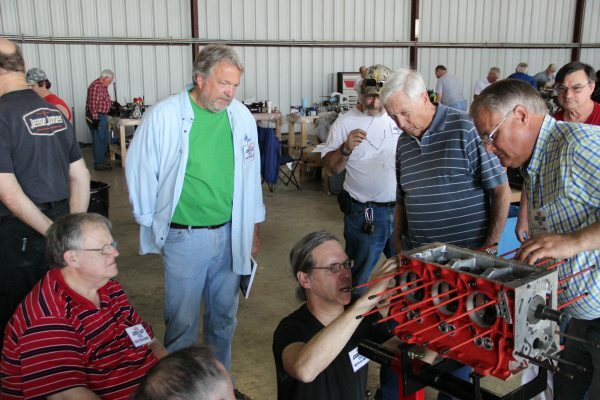 Being constantly exposed to builders, not at airshows but in the workshop setting, gives us a priceless reality check on the success of our program in the way that mere sales figures never could. I can say that we really understand builders in a way that most other aviation business never will. The Colleges have refined our work in so many ways it is hard to consider what out efforts would look like in their absence.